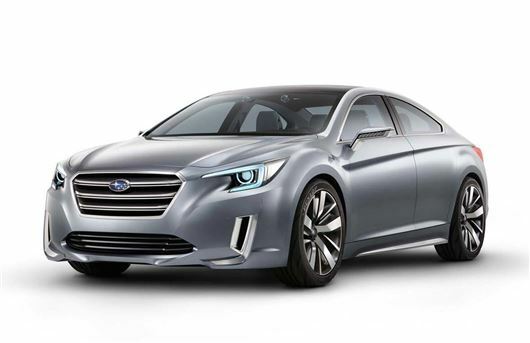 Subaru will unveil its Legacy Concept at the Los Angeles Motor Show this week, showing what the next generation Legacy will look like. The current model, now only available as an estate, hasn't proved as popular as the Legacy has previously in the UK - not helped by poor economy and high emissions - so this new version is expected to be much improved. The Legacy Concept continues the look of the WRX Concept which was shown at Frankfurt Motor Show earlier this year. As with all Subaru cars the new Legacy will come with boxer engines - both petrol and diesel - plus all-wheel drive as standard. The concept has a coupe-like profile with hidden rear door handles and a rising window line. Large wheels and big wheel arches help the stance on the concept while inside the interior is described as the most high-tech ever seen in a Subaru. It has a smartphone-style centre console and instrument panel that extends from the front to the rear of the cabin. There's room for four passengers and a driver-focused cockpit. The concept has brown leather upholstery and blue accents throughout. The Legacy also features the latest version of Subaru’s driver assist system, called ‘EyeSight’, which monitors the road ahead and recognises potentially dangerous driving situations. It's not been confirmed if or when the Legacy will come to the UK but given Subaru's ageing line-up, we expect it to be sooner rather that later. Subaru cannot sell 4 x door saloons in the UK in any volume - nobody else can and they have proved it by dropping all saloon Legacies a few years back and only selling Estate cars. Why on earth would they release "new model information" and show pictures of a saloon! Subaru sales have dropped like a stone - No Imprezas (their biggest seller in the past), poor mpg Legacy/Outback/Forester petrols and diesels that are manual only! I know they are getting away from the Scooby reputation but to increase sales you need to offer high quality, reliable cars of the type most people buy and it is not 2.5 litre petrol cars. The USA & UK are different car markets. Mind you if they sold a £25-£30K Legacy for the $25K price they charge in the USA then their cars would sell!